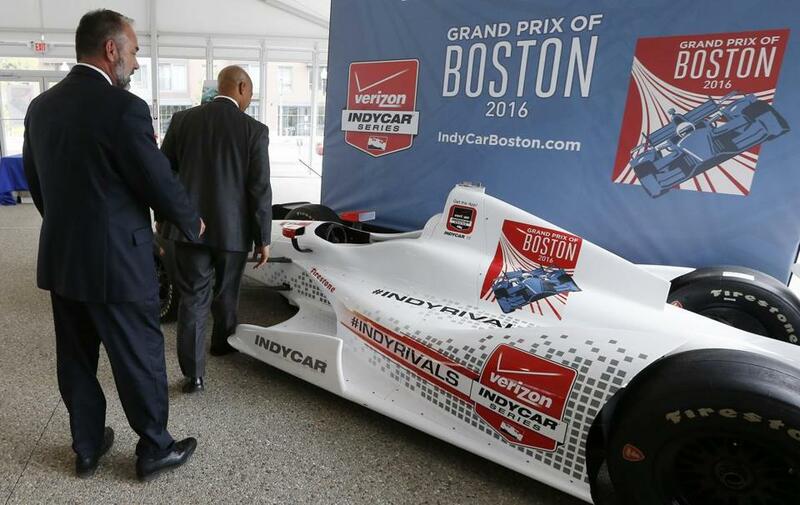 Boston officials examined an IndyCar mock-up following a news conference last May. The city’s inaugural IndyCar race had been scheduled for Labor Day weekend, on a 2.2-mile temporary street course around the Boston Convention & Exhibition Center. Promoters last May signed an agreement with Mayor Martin J. Walsh to hold the race in 2016, then annually for up to four more years. Boston is 0-2 recently on new, attention-grabbing sporting events, with the demise of the race coming less than a year after Boston’s bid for the 2024 Olympics collapsed. Opponents on Friday cheered the end of the Grand Prix. Casey said city officials made relentless and unrealistic demands on the promoters that eventually just became too much to bear. Casey’s announcement comes after months of negotiations with city and state officials on agreements governing the conduct of the race. In a Globe interview, Brophy said the city insisted on protections for the taxpayers and the neighborhood. “They didn’t want to do it, and we’re OK with it,” he said. The race promoters, he added, were highly disorganized. LogMeIn CEO Bill Wagner signed on early as a major sponsor for the event, in part because of the positive attention he said the race would bring to the city and to the neighborhood. His company’s Summer Street offices overlook a portion of the race course. “We’re really disappointed,” said Wagner, who pointed to a city Conservation Commission vote last week that added to the race’s permitting woes. “It felt like another hurdle was thrown at them,” Wagner added. Wagner noted that ticket sales were off to a stronger-than-expected start, and employees at his high-tech company were enthusiastic. The long-term impact to the city, Wagner said, could involve ripple effects that go well beyond the loss of the Labor Day weekend race.